"Muscatnukbaum, Nux Myristica" ~ 1675 ~ Wolfgang Helmhard Freiherr von Hohberg ~ Lust und Artzney-Garten des Köeniglichen Propheten Davids. PRINT ENTITLED: "Muscatnukbaum. Nux Myristica". SOURCE: Lust- und Artzney-Garten des Köeniglichen Propheten Davids. Johann Ernst Gerhard, Hieronymus Gradenthaler, Johann Ludwig Prasch. MUSIC: Jerome Kradenthaller, Hieronymus Degree Thaler. EDITOR: Regenspurg: Frey Singer & Emmrich. BOOKSELLER: Emmrichs Beeder, burgers and booksellers dasselbst. plants to include description of their usefulness, and morning & evening prayers. HISTORY: Lust- und Artzney-Garten des Köeniglichen Propheten Davids is described as one of the most beautiful books of the seventeenth century. A 526 page publication, the text contains 300 copperplate engravings, many being plant images. The illustrated engravings are printed on both sides of a page. It is written in the form of Emblem (Kunsthistorische Kategorie) [ ἔμβλημα ~ in Latin] where as an art form, images and text are combined in a creative way using three parts: the Lemma (a motto or verse at the top), the Icon (which is the visual engraved image), and the Epigram (a written puzzle to connect the Lemma and Icon to make the reader solve a deeper meaning). Within this book, the Lemma on the "Recto" (or face or front of a page) are written in Latin and German verse; the "Verso" (back of a page) uses illustrations of plants and is written only in German. 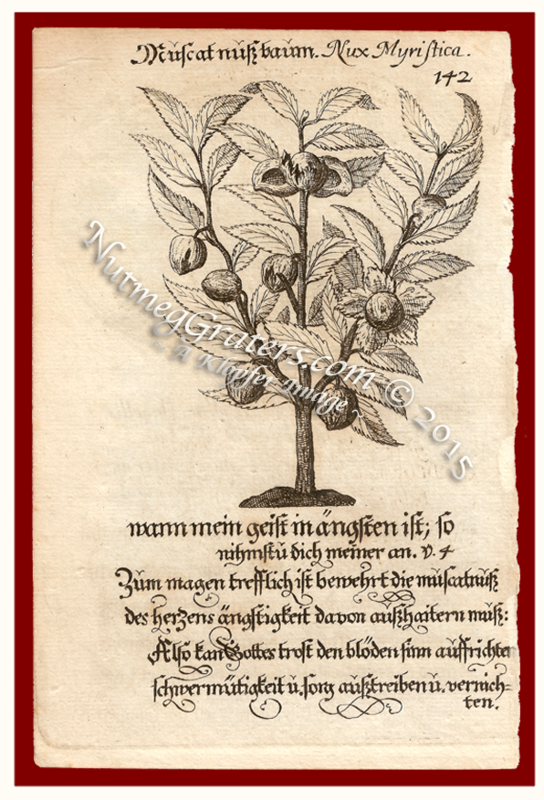 Translating page 142, which is a "Verso" page, "Muscatnukbaum, Nux Myristica" seems straight-forward: It describes that the nutmeg from the nutmeg tree is God's way to aid management of the spirit, while being excellent for the stomach and beneficial to quiet the heart. Being among early illustration for nutmeg, the engraving does not accurately depict the "nutmeg tree", instead showing a contemporary image of the era. 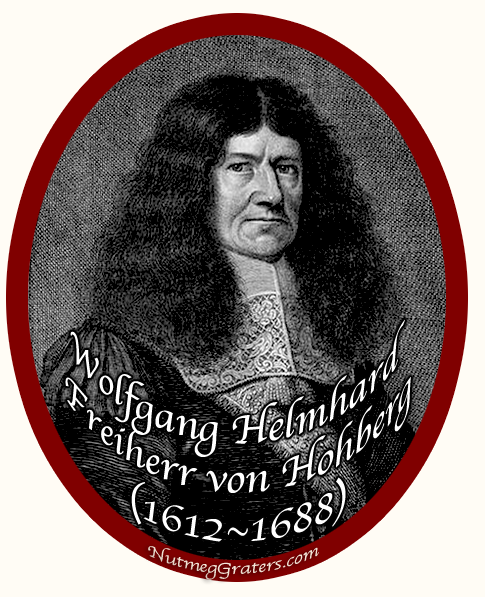 Although Wolfgang Helmhard Freiherr von Hohberg (1612~1688) is given primary credit as author, he also acted as the editor by including well known works from other authors and artists of the period. 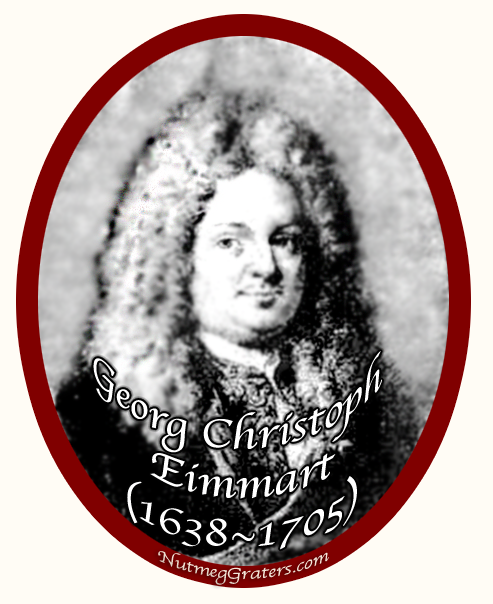 Georg Christoph Eimmart (Jr.) (1638-1705) is credited as the engraver. The majority of the music is by Hieronymus Degree Thaler. The paraphrase of the Psalms is by Johann L. Prasch.